Nail guns had made our lives easier. Instead of working all day and all week hammering nails, you can now drive thousands of nails in just a day and of course, finish your home renovation project in lesser time with quality results. But before rushing to the nearest hardware store or opening Amazon’s online store, you should know that the nail gun comes in different types and is used differently depending on the job you are working on. Let’s start First with the brad nailer then we’ll introduce you to our Hitachi NT50AE2 18 Gauge nail gun that everybody loves. Brad nailers use thinner gauge nails with smaller heads to attach the lightweight trim. One great advantage of using this kind of nailer is that there is no need to cover the hole. Also, using a brad nailer poses a smaller risk of splitting or breaking thin pieces of trim. The Hitachi 18-Gauge Brad nailer is a well balanced and also lightweight pneumatic nailer ( 2.2 pounds), yet it is powerful. Its aluminum casing and elastomer grip assure comfort, precision, and also efficiency. 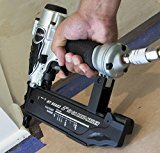 This Brad nailer tool accepts 5/8″ up to 2″ 18 Gauge fasteners, and it provides also a quick and easy nail jam extraction with no tool requirements. In addition, the Hitachi NT50AE2 18 Gauge nail gun is equipped with a dual firing: sequential and bump fire modes. More than that, it is fitted with a no-mar tip that protects your work from scratches or unintended markings, and the driving depth can be adjusted simply through a knob that is placed close to the nose for a professional finish. This tool requires 70-120 PSI to operate normally, and also the magazine is able to hold up to 100 nails. On the other hand, most parts of the Hitachi NT50AE2 18 Gauge Nailer are made out of plastic, which explains its lightweight (2.2 pounds). So it is extremely fragile and may break if dropped, especially since it comes with no belt hook to be attached to or if it’s used extensively. But if handled well and carefully and used only for small projects, you can be sure that this nail gun would last for years. In addition, our tests have shown a higher occurrence of misfiring compared to competitors. Does n’t come with a belt hook. In Addition, Another Disadvantage of the Hitachi NT50AE2 is that it requires oil to operate smoothly. Some customers find it a disadvantage since it means refilling the oil. However, this is a minor issue considering that the oil never leaks from whatever angle you use the gun. Also, it takes a long time for the oil to require changing. You can read a full description of this product here. Who should buy the Hitachi NT50AE2 18 gauge? Mainly everyone can buy this tool: men and women likewise, since it is lightweight and comfortable, and doesn’t require much effort to handle and operate. Another reason is It can be used for small projects around the house, or small carpentry jobs, for cabinet installation, picture-frame assembly or even for furniture construction. The Hitachi NT50AE2 falls in the low price category and is therefore suitable for buyers on a budget. This nail gun also is definitely not suitable for big projects that require high pressure and/or extensive use. The Hitachi NT50AE2 comes with a 30-day money back guarantee and also it has a 1-year warranty. We have also gathered for you what other people who bought/used this Hitachi nail gun have said about it it gives you also additional Idea of buying the Hitacji NT50AE2. The NT50AE2 would not perform well for pressure intensive projects but will get the job done for smaller projects around the house. Remember that the parts made of plastic are fragile, so if you choose to go with this nail gun you have to be careful with it, a fall of more than one meter might break it. 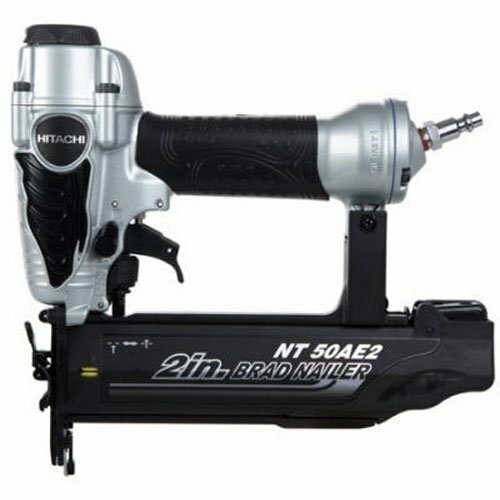 In addition, NT50AE2 2-Inch brad nailer from Hitachi is lightweight, ergonomically designed, and also quite compact.It minimizes downtime because of the high capacity magazine while it makes simple to switch from continuous to intermittent firing because of the easy adjustments. The disadvantage of this tools is that a user has to monitor oil usage to be guaranteed for optimum service and also for operation. Overall, it is would be a great idea to include the Hitachi NT50AE2 2-Inch 18-Gauge Brad Nailer in your toolbox. Our Final Rating is 3.2 stars. We crawl the web regularity to find the best price and also reliability ratio for the products you need. Finally, after extensive research, we recommend that you buy the Hitachi NT50AE2 Nail Gun at Amazon, as they offer, in our opinion, the best price-to-reliability ratio. Watch also this video it may help you to decide on buying or choosing Hitachi NT50AE2. The Hitachi NT50AE2 18-Gauge Brad nailer is certainly not the best nail gun out there, but if you are on a tight budget this tool can be suitable for you. It is practical, comfortable and lightweight.